With the colder weather we've been having, I've been craving comfort food & this really pie hits the spot. 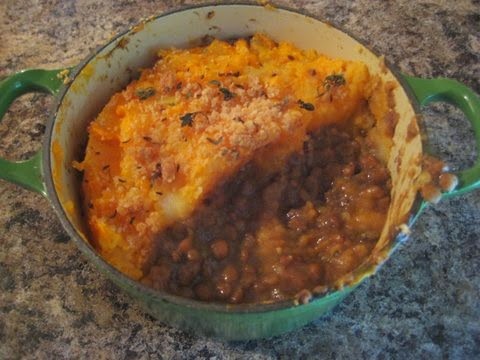 this is a gluten, dairy, nut, meat free version of shepherd's pie, so it should be good for most intolerances. 1 400g can of green or puy lentils. Drain the can of lentils & rinse well. set to one side. 1 peel the shallot, chop it up, and slice the button mushrooms. Saute in a little oil of your choice ( I use light olive oil) in a frying pan over a medium heat for a few mins until the shallot/ mushrooms start to soften & brown. set to one side. 3 transfer the shitakes and the stock they cooked in to a blender (as if you were making soup) and add the Tamari, balsamic vinegar & red wine. blitz. you want a thick soup like texture. Add some salt & pepper to taste. Once cooked, drain the water away and then mash with a little milk of your choice (I used soy) and a little olive oil (optional if you want to keep the fat/ calorie levels down) until you have a nice smooth, creamy mash. 6 pile the mashed potato/sweet potato on top of the lentil & mushroom mix. At this point I crumbled a slice of gluten free bread on top and dotted with some chopped thyme (optional). You could also slice a tomato to put on top & If you're fine with dairy, then you could add some grated cheese. Bake in a moderate oven (around 180c) for about 30 mins. 7 if you want a crispier top you can put under a hot grill for a few minutes.